In 2014, Delaware Farm Bureau Foundation set out to raise funds to buy a truck to bring the Ag Lab mobile classroom to summer camps and schools in Delaware. Thank you to our sponsors from Delaware Electric Cooperative, MidAtlantic Farm Credit, Willis Chevrolet, FFA Foundation, Hoober, Inc., Nationwide Insurance, and TA Seeds, we were able to raise $20,000 to purchase a truck for the Ag Lab! Thanks to the generous donation of the 26′ trailer from Delaware Department of Agriculture, the Ag Lab is a mobile classroom brought to schools and summer camps throughout Delaware to teach kids ages 5-12 about farming. The Ag Lab aims to educate youth about healthy eating and agriculture as an industry and way of life through a co-operative lesson that helps children learn where their food comes from, how it’s made and what different careers are available. 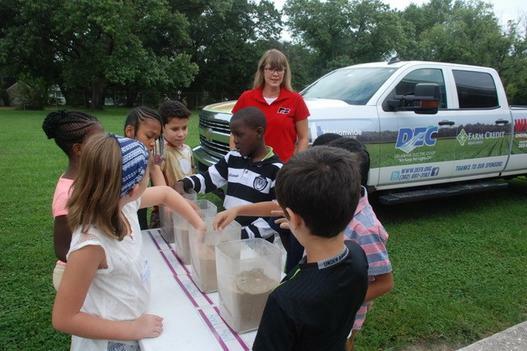 Foundation manager Laura Simpson teaches children about different soil types in front of the Foundation Truck. Delaware Farm Bureau Foundation holds a live auction every year at the DEFB Annual Banquet. We also have items auctioned at the Ag Industry Dinner. In total, the live auctions have raised $7,650 for the Foundation. 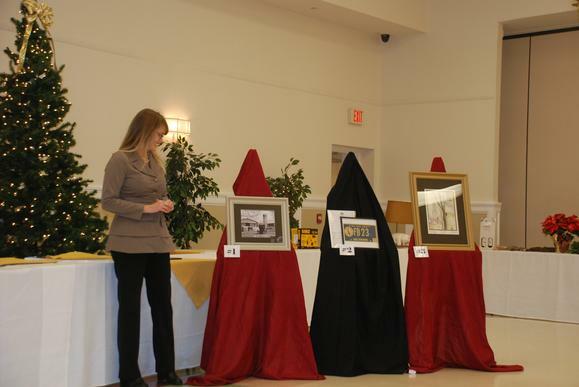 Foundation manager Laura Simpson stands in front of three live auction items at the 2016 Annual Banquet.